NASA’s OSIRIS-REx spacecraft made an astonishing discovery about the asteroid it has been orbiting since December: the rock is actively spewing material out into space. The asteroid, named Bennu, has ejected materials up to 11 times since the spacecraft has been there. But no one is sure what exactly is causing these bursts. The revelation is just one of many surprises that scientists have learned about Bennu, ever since OSISIR-REx reached the asteroid late last year. Launched in 2016, OSIRIS-REx is tasked with eventually grabbing a sample from Bennu and then returning it back to Earth, to help scientists better study asteroids — remnants of the early Solar System. 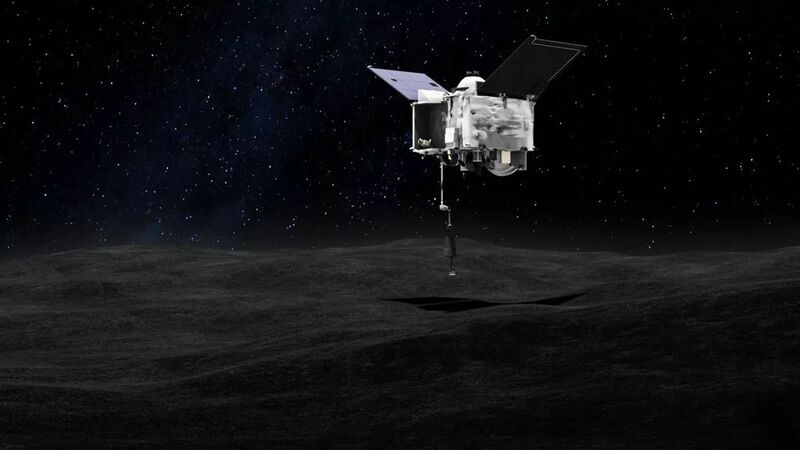 But before that happens, the OSIRIS-REx mission team is trying to learn as much as it can about the asteroid using the spacecraft’s instruments. That’s led to a few unexpected discoveries, some of which were detailed today in the journal Nature. Not only is Bennu shooting particles out into the void, but the asteroid is also much more rugged than scientists originally thought — which may make it a little bit harder for the spacecraft to grab a sample. Thanks to all that OSIRIS-REx has learned, the mission team now knows they will have to work extra hard to characterize and map the surface of Bennu before they start sampling. Before OSIRIS-REx arrived at Bennu, the mission team tried to figure out as much as possible about what kind of rock they were about to visit. Scientists gathered data on the asteroid using telescopes both on the Earth and in space. 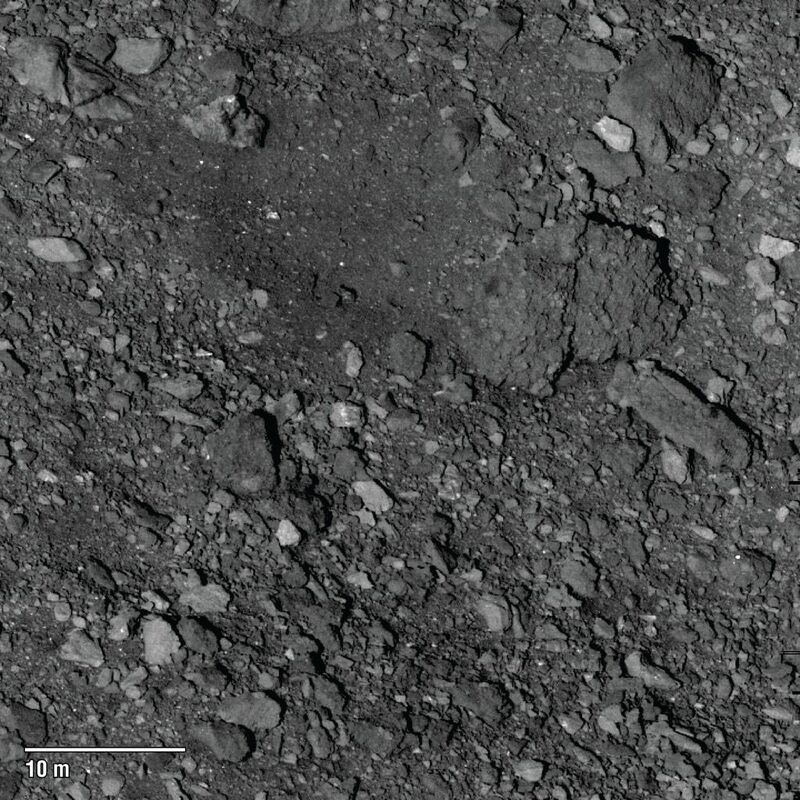 Based on how Bennu’s temperature changes and how light reflected off the rock, the OSIRIS-REx team interpreted that there were a lot of smooth areas of fine grains on the surface of the asteroid — like large patches of sand — and very few boulders. That made the asteroid an ideal place to visit. Sandy regions are perfect for grabbing a small collection of particles, especially with the sampler attached to the OSIRIS-REx spacecraft. The probe has a robotic arm that will extend out toward Bennu and gently tap its surface for just five seconds. During that short period, the sampler will fire nitrogen gas, stirring up the particles on the asteroid and causing them to shoot up inside the spacecraft. But when OSIRIS-REx arrived at Bennu in December, the mission team quickly realized that their vision of a smooth, beachy asteroid was a little off. “That is not what we’re seeing in terms of the asteroid,” Lauretta says. “It’s pretty rugged, very bouldery.” Large rocks and boulders are peppered across Bennu’s surface. The team had estimated that there would be just one boulder on Bennu about 10 to 20 meters wide. They’re now seeing a couple hundred boulders within that size range. Such a rugged terrain introduces more risk into the sample collection, as it could throw the spacecraft off or larger particles could clog the sampler. Lauretta believes that the team simply made the wrong inferences on Bennu’s boulders based on the data they had, but that they were correct in some aspects of their interpretation. They think that the boulders are likely pretty sandy themselves, consisting of fine grains bunched up together. That’s why, despite this rugged discovery, the team is optimistic. “The good news is we think that it’s sample-able, that we will get a sample off the surface,” Lauretta says. “But it’s going to require some work to improve the guidance system to get us into a tighter spot.” Currently, OSIRIS-REx is designed so that it can touch down within 25 meters of the desired sample site. But Lauretta and his team have realized that they’re going to need more accuracy than that because there aren’t any smooth areas that large on Bennu’s surface. Now, they’re looking at patches that are just five to 20 meters across. In the meantime, OSIRIS-REx will continue to orbit Bennu and collect data, which is no small feat. The asteroid is just slightly wider than the height of the Empire State Building, so it has very little gravity. When OSIRIS-REx entered orbit around Bennu on December 31st, the asteroid became the smallest object that’s ever been orbited by a space vehicle. As OSIRIS-REx orbits, it will continue to decode Bennu’s secrets. The spacecraft will keep watching out for this geyser activity to better understand the mechanism behind it. Already, the scientists have found that some of these particles are injected into space while other particles actually rain down on the asteroid. And some ejected pieces actually remain in orbit around Bennu as natural satellites, something that’s never been seen before in Solar System objects like this, according to Lauretta. Meanwhile, the spacecraft has helped scientists realize that Bennu is actually spinning faster thanks to radiation pressure coming from the Sun. So in 1.5 million years, the rock will be spinning twice as fast as it is now. Additionally, OSIRIS-REx already discovered that water is lurking inside Bennu in hydrated clays, but the spacecraft also found that a mineral called magnetite is present. Magnetite typically forms within water systems, according to Lauretta, and is usually an indication of intense water activity. A sample site for OSIRIS-REx will be picked this summer, though the team has already narrowed down a few spots of interest. But the team is particularly eager to sample a site high in magnetite, as it could paint a picture of how much water and organic material was present in Bennu’s past. And that could tell us a lot about how our cosmic neighborhood came to be. Asteroids are considered to be snapshots of the early Solar System, as they’ve been around since before the planets first formed 4.5 billion years ago. Scientists also think that asteroids like Bennu may have brought water and organic materials to Earth, helping to spark the earliest formation of life.